It was beginning to get dark, the shadows were getting longer and the air getting colder. We rushed to the castle at the Disneyland Theme Park in California and arrived with ample time to take photos and tour inside the famous castle. "Opened on July 17, 1955, the castle is the oldest of all Disney castles.." ref. I couldn't miss the castle this time around! Three years ago during my first trip to the USA, we arrived at the castle too late - the camera we brought (then, just a simple normal film camera) could not capture the castle in the darkness. Boo! Not this time though. And we met Mickey too. Awesome. Did you know it was Sleeping Beauty's castle? I didn't. 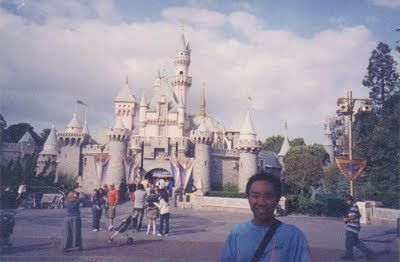 But growing up to watching Walt Disney Cartoons and Movies gave walking inside that castle so, well, cool. Haha. 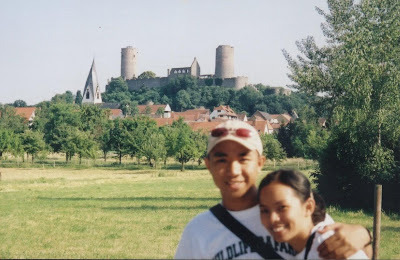 "Münzenberg Castle in the Wetterau near Frankfurt am Main is one of the most important German castles from the time of the Staufer dynasty (12th century)." ref. We were ready, our borrowed bicycles creaking with excitement. We were going to a castle. A REAL LIVE ONE. lol. It's not live but you get the point right? With a few bottles of water and some snacks, we were off. We needed to go beyond a supermarket near the big road, off to the other side where the sign by the road says "Münzenberg Castle" in big letters. There's a path there, and we needed to be careful not to miss it- a concrete path that cris-crosses through a huge field of grass and small trees. From there you can already see it - the castle - above the hill, it's towers still standing after centuries, majestic over the houses with same colored roofs. The final landmark was the train tracks, a sight familiar to our Asian eyes. We got off our bikes and took photos. And then there it was, the huge entrance to the castle. A small token for a fee, a small garden patch on the side, and then up the ramp into the courtyard. It was it ruins, a castle of old, but our eyes lit up at the sight of broken stone walls and gates and windows. We were inside a real castle. Gasp! Suddenly all those fairy tales seemed like they could come true. See more photos of the Münzenberg Castle here. Special Thanks to @eyevasco, @ditesco, @christianBON and @Zorlone for the Espagnol translation for the title. It being in Spanish has no relevance at all to my post - I just wanted it to say "El Rey" which means "The King" so that I could change it to "Rey-jr". lol. Receive free updates. Subscribe in a reader.